I came into his life in August 1964 when I was asked to join The Hi-Fi’s. Straight away I new I was in a professional band. Brian Bennett was vocalist and organist, Ted Harvey was vocalist and bass, I was on guitar and vocals. Malc was on drums. We didn’t let him sing. Malc was still our drummer but we still didn’t let him sing! 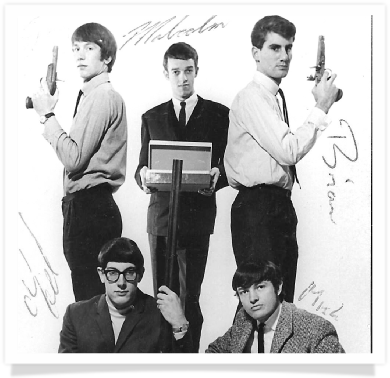 The Hollies/Tornados/Heinz. We backed Jess Conrad. We had to let him sing! The Hollies drummer, Bobby Elliot, became Malc’s idol, he would watch Bobby all the time and his own playing became better and better. Then we did a summer season on a boat based in Jersey, where we learned to drink, because it was cheap. A couple of funnies from that time. We had the Govenor of the Island coming to inspect the ship and we had to play the National Anthem as he came aboard. Malc did a massive drum roll. We started to play. Two bars in, the on-board generator blew up and filled the room with smoke. I think we got the blame for that. Another time we arrived back to Jersey from St Malo, late at night and empty. We’d all had a little drink and the first mate was completely out of it, so Malc & I operated the aft end winch and tied the boat up alongside the quay. When the guy on the harbourside saw us, he said,” Aren’t you two guys in the band?” we just went, “Shhhhhhhh” and walked away. When we came home, we did a couple of Kathy Kirby TV Shows, made another record and backed Julie Rogers for a while. Then the band changed personnel and we went off to Germany. Now Malc was not a great one for learning the language but I’m sure his wife Pat will forgive a little story. In Hamburg, Malc fell in love with the girl at the supermarket cash-out. He wanted to talk to her but didn’t know how. So we helped him. We gave him a few useful phrases and sent him to buy 2 kilos of loose rice. The problem was we gave him a string bag to carry it in. That romance came to nothing of course. You probably know that Malc was the technical bloke in the Hi-Fi’s. Well, also being security- minded, he wired up the downstairs metal doors and windows to the mains not knowing that Mickey had gone out for a drink with some mates. When he came back, the screams could be heard miles away! When we played at the Famous “Star Club” in Hamburg, I’m sure that Malc was the reason that The Glitter Band had 2 drummers because he went on stage with the band, who became The Glitter Band. He and I became good drinking buddies with Gary Glitter when he was Paul Raven & the Boston Show Band. That’s a long time ago and a lot of dirty water has gone under the bridge since those days. We had a great time in that band. We all got on so well it was like one long holiday. We worked hard and played hard. Gary Unwin said that was the best time he’s ever spent in any band. We were like brothers. Which is why we’re all still mates today. When Malc got us together for His and Pat’s anniversary in 2002 it was just like old times. And we let him sing! We even had old Len Ford who went to school with Malc and started The Hi-Fi’s when they were kids! Then, we did it again in 2004 for the lovely daughter Claire and Ben’s wedding. Another great time but Malc had to spoil it by passing out at the end. He had just played his heart out for his daughter and Ted, Mickey, Len & I were very happy to have been part of it. Do you know what he did the next day? He phoned me up to say thank you for playing and how sorry he was for causing such a fuss at the end of the evening. That’s the kind of bloke he was. Malc, I’m happy to have known you old friend.